There cannot be an adult in the whole of the UK that was not, at some point in their education, subjected to endure hour after dull hour of Shakespeare. Typical experience seems to be of a monotonous teacher forcing students to read aloud from Macbeth, Twelfth Night or Othello in the hope that such dictation would bring to life Shakespeare’s plays. Of course Shakespeare’s plays were not written to be read, but written to be performed in an engaging and thought provoking manner. It is this true expression of Shakespeare that Shakespeare’s Globe aims to capture as it recreates the late sixteenth and early seventeenth century experience of his plays. 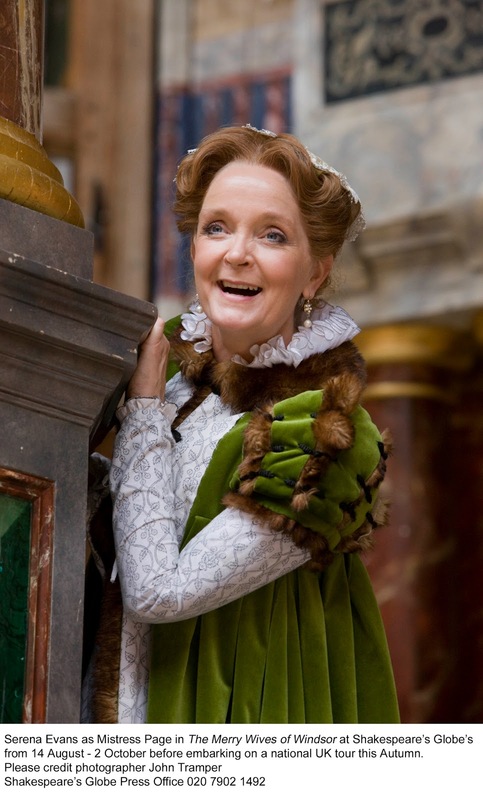 The Merry Wives of Windsor, a comedy believed to have been written in 1597, is currently beginning a six week run at Shakespeare’s Globe, before continuing on a tour across the UK. The performance tells the tale of Mistress Quickly, an entertaining busy-body who activates the plans of Mistress Ford and Mistress Page. Mistress Ford and Mistress Page both receive identical, not entirely poetically romantic, letters from the sexually frustrated and insufferable Falstaff. Reading ‘Ask me no reason why I love you... for you are not young’, continuing with ‘you love sack and so do I; would you desire better sympathy?’ before concluding ‘Thine own true knight, by day or night, or any kind of light, with all his might, for thee to fight – John Falstaff’. The two women, who coincidentally are best friends and both married, formulate a plan to humiliate Falstaff in to seeing the error of his ways. The truly outstanding performing of; Sarah Woodward, as Mistress Ford; Serena Evans, as Mistress Page and Sue Wallace as Mistress Quickly, follow Shakespeare’s narrative as they lead Falstaff on a merry dance in which he hopes his sexual desires will be fulfilled. But the mistresses easily deceive Falstaff who is blinded by his testosterone. They trick him in to hiding in a wash basket so he gets tipped in to the river with all the dirty laundry, they have him dress as a woman, a witch in fact, then battered by Master Ford, before finally hoodwinking him in to sitting on a tree stump with chains around his neck and antlers on his head as he is surrounded by fairies and pixies. A ridiculous narrative perhaps, but in the enchanting confides of the Globe the performance is entertaining, hilarious and jovial. The truly exceptional skills of all the actors, but particularly Christopher Benjamin who plays Falstaff for whom one cannot help but love, prove that Shakespeare’s prose is as engaging and entertaining as it was four centuries ago. Intertwined within this narrative are the trio of admirers of Mistress Page’s daughter, Mistress Anne Page; Master Slender, Dr Caius and Master Fenton all of whom seek the hand of the young and beautiful Anne. Master Slender, dressed in luminous green and brilliant red, is so ludicrously dim witted that he is incapable of holding conversation with young Anne, yet he is her father’s choice of husband. Dr Caius, who is French and displays traits still stereotyped to this day, is Mistress Page’s choice of husband for her daughter, he is intelligent but firey and much too old. It is Master Fenton to whom young Anne’s heart belongs, but despite his family coming from the higher echelons of society he is poor, and therefore unsuitable. However the young lovers deceive Master and Mistress Page in order to marry, and the Page’s are forced to accept that ‘in love the heavens themselves do guide the state; money buys lands, and wives are sold by fate’. Despite the comedy of Master Slender’s stupidity and the farce of Dr Caius and his French ways, Shakespeare reminds the audience that love is an affair of the heart, it cannot be bought or sold or forced. Further embedded within the narrative are critiques of jealous husbands, for Master Ford is so blinded by green eyed envy that he cannot see his wife’s love for him. While the audience is entertained by Master Ford throwing dirty lingerie around the stage as he rummages in the wash basket for Falstaff he insists ‘I have reason to be jealous’. Shakespeare’s message was no doubt one of more sincerity. Additional social observations are entangled in the narrative as the audience witnesses the hypocrisy of Sir Hugh Evans, a Welsh Parson who drinks like a fish and is deceitful, and the almost homosexual kiss between Master Slender and the young man pretending to be Mistress Anne Page. This may be acceptable in the twenty first century, but four centuries ago Shakespeare was most certainly pushing socially acceptable boundaries. 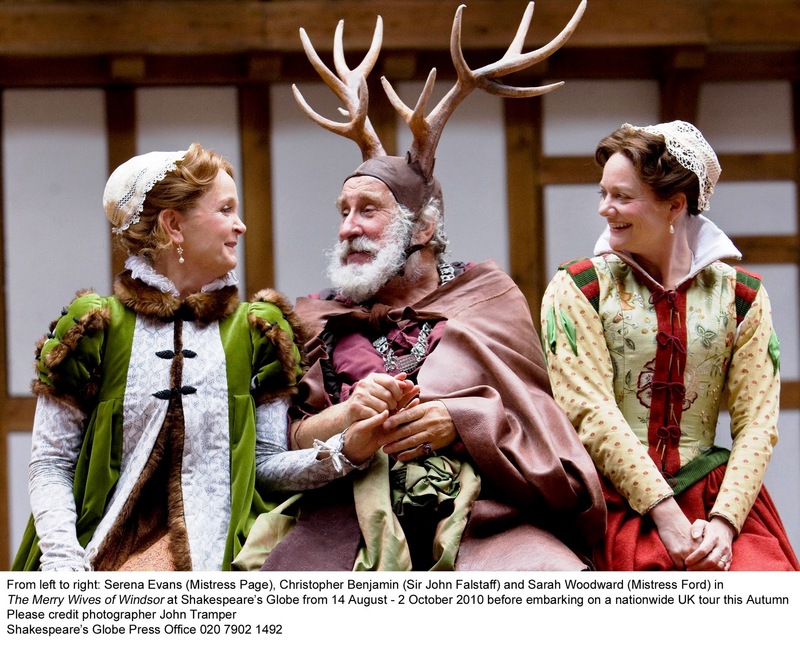 The Merry Wives of Windsor excels itself in promoting Shakespeare’s lyrical genius, whilst providing an audience with laughs a plenty and a frivolous evening. In addition it proves that Shakespeare is just as relevant, absorbing and amusing now as it was when it was written. Shakespeare has certainly not lost his ability to hold an audience. The Merry Wives of Windsor is currently on stage in New York, but will be touring the UK from 16th November.